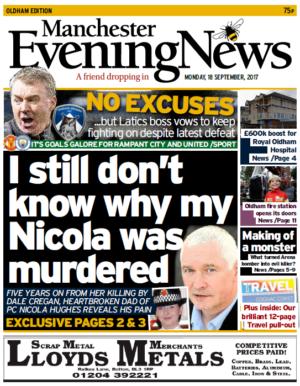 The Manchester Evening News has launched an edition specifically covering Oldham, just days after Newsquest announced it would be publishing a new weekly paper in the town. It follows the closure of the Oldham Evening Chronicle, which went into administration earlier this month. The Trinity Mirror-owned MEN said it had already seen an 8% lift in the number of news pages read online by people in Oldham since the start of September. It will now include several pages of Oldham news towards the front of a new Oldham edition paper, including a localised front page and coverage of Oldham Athletic. MEN Editor-in-Chief Rob Irvine said: "It was a sad day for the town when the Chronicle ceased publication after 163 years. "But the town still retains a daily newspaper with the Manchester Evening News being a long-standing favourite. "It is clear from the number of additional readers coming to us in recent days that there is strong desire for a daily mixture of local, regional and national news and sport. "So we are stepping up our daily coverage of the town and also making sure that Latics fans are well served. "We have substantially increased our reporting presence in the town and contacting groups and organisations direct and through social media to tell them that the MEN is here for them." The Oldham Times, Newsquest's new title, will go on sale on Thursday for 80p.